A classic cologne with a herb and musky scent, created by Legrain in 1943. Notes of lemon, lavender and rosemary. If there is a single fragrance able to deceive the senses, without a doubt, this is Royale Ambree eau de cologne by Legrain. Essence soft and delicate, this perfume brings in his body the purity and exquisiteness of the floral aromas. 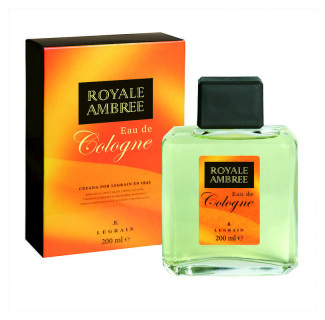 Wild and fresh, its price may not measure the softness of his touch, but without a doubt buy the Royale Ambree eau de cologne of Legrain is a success for the day to day. With a heart intensely aromatic and spicy white flowers, jasmine, violet, as well as a fund-based Moss Woody and musky, acidic and addictive this woman perfume essence is indelible memory of all those who feel it ever.